Executive summary: Many organizations are taking steps to make buildings more energy efficient and more sustainable. At the same time, many are implementing smart building measures. The results of a new survey of facility executives demonstrates that smart building measures are being used to improve energy and sustainability performance, and that those measures have in fact proven to boost performance in those areas. But a more strategic approach to smart buildings, combined with even wider use of smart building measures, represents an important opportunity for facility executives to drive further gains in energy efficiency and sustainability. This white paper examines facility executives’ experiences with smart buildings and shows how smart building measures can enable other key organizational goals. It’s a rare facility executive who doesn’t devote significant effort to improving energy efficiency or sustainability. These two issues are now priorities for many organizations. Increasingly, organizations are also seeing the benefits of implementing measures to make their buildings smarter. And as those smart building strategies have been implemented, experience has shown they are key enablers for meeting energy efficiency and sustainability goals. The synergy among sustainability, energy efficiency, and smart building strategies suggests facility executives should address all three in combination, rather than each separately. For example, smart building strategies can help facility executives ensure good indoor environmental quality leading to occupant comfort, a key sustainability goal, while hitting energy efficiency targets. Indeed, smart building strategies should be seen as key ways to achieve energy efficiency and sustainability goals. Today, however, the fact is many organizations have failed to take advantage of key smart building opportunities that can not only improve operational efficiency, but also reduce energy costs and buttress sustainability efforts. Many organizations have also failed to link smart building strategies with strategies for energy efficiency and sustainability. But the next few years should see a significant increase in the implementation of important smart building measures. These are among the key findings of a survey of facility executives conducted by Siemens Industry, Inc., and Building Operating Management magazine, as well as discussions with facility executives and other experts in the field. That research points the way to the wider use of smart building technology to help achieve energy efficiency and sustainability objectives. Although there is no single, universally accepted definition of a smart building, widespread agreement exists about some of the key elements of the concept. A key part of the consensus is that smart building strategies improve the productivity of people and processes in buildings and lead to better decisions, based on actionable information, for improvements to the facility. Technology is also critical. For example, smart buildings tap building automation systems (BAS), allowing facility executives to have the building’s core systems seamlessly integrated. And smart buildings often leverage advanced technology to make their properties as efficient and sustainable as possible. A smart building strategy “works to ensure that a building can provide timely, integrated systems information to building owners, managers, and tenants so that they can make intelligent decisions regarding operations and maintenance,” explains Ronald J. Zimmer, president and CEO of the Continental Automated Buildings Association (CABA). This plan “evolves with changing user requirements and technology, ensuring continued and improved optimization,” Zimmer says. Smart buildings are comfortable buildings for occupants. “Ideally, such a strategy leads to a building that uses both technology and process to create a facility that is safe, healthy, and comfortable and enables productivity and well-being for its occupants,” says Zimmer. “1. The Hippocratic Oath: ‘First, do no harm’ when spending capital and operational budget money by avoiding proprietary solutions and disconnected building systems. “2. Lower Cost Structure: Create a base strategy that lowers your overall and ongoing capital and operational cost structure. This aligns all planned projects and spending with a smart building strategy. The top two items on the list are measures that often have a very rapid payback or are very low cost — not surprising, given the economic conditions of the past three years. But the survey indicates smart building elements have been under-deployed in comparison to how important facility executives say those elements are. The survey asked whether a range of measures were important for achieving energy and sustainability goals. Sixty nine percent of respondents say “integration for building systems” is an important smart building strategy to meet energy and sustainability goals, yet only 39 percent of respondents report having implemented integration in the past three years. Similarly, 52 percent say “automated monitoring and reporting” is important, yet only 37 percent report having implemented it. A similar situation holds for “automated fault detection and diagnostics” (31 percent say it’s important but only 14 percent implemented it), “automated optimization” (30 percent vs. 15 percent), “continuous commissioning” (24 percent vs. 10 percent), and “dashboards” (21 percent vs. 12 percent). One exception to this pattern: 54 percent of respondents call controls upgrades important and 47 percent say they performed controls upgrades in the past three years. 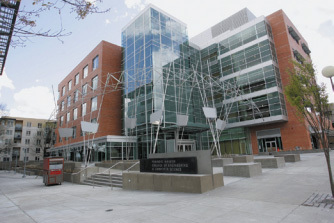 Portland State University (PSU) earned LEED Gold certification for its Northwest Center for Engineering Science and Technology by tapping both smart building technologies and smart water strategies. The building features natural lighting, natural ventilation of its five-story atrium, a rainwater harvesting system that supplies water for toilets and urinals, and geothermal heating and cooling from underground springs. The facility’s building automation system (BAS) controls geothermal water flow and the rainwater harvesting system’s water flow applications, as well as controlling the motorized operable windows and providing indoor air quality measurements. The BAS also is integrated with building systems for fan controls and shutdown operations for life safety. Rainwater from the roof goes into a sediment tank to allow large particles to settle out. A sump pump transfers the untreated water from this tank into the storage tank. Water samples from the storage tank are pumped through a flow cell where the automated controller monitors and compares oxidation-reduction potential to a target setpoint, pumping in sodium hypochlorite as needed. Two ultraviolet systems disinfect water as it is pumped to its usage points and as a sidestream treatment for the storage tank. During the rainwater system’s first eight weeks of operation, no city water was used for flushing toilets and urinals. By combining smart energy and water efficiency technologies, PSU uses 45 percent less energy than Oregon code and nearly 40 percent less water than it did in the past, according to the university. This entry was posted in Industry News, Industry Resources and tagged Building automation, Building Automation System, Facility management, Smart Building Strategies on March 6, 2014 by setpointsystems.